toys are good food » Blog Archive » Tasty Treat or Corporate Shill? They messed up the prize!! When I was younger, I remember getting cheaply-made metal trinkets, cardboard tchotchkes and every kind of paper product imaginable. The folks that worked in research over there were amazing. If it was small and could be made out of paper, they could do it. 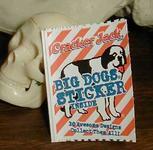 Remember that Cracker Jack pioneered the concept of the temporary tattoo. Sure, they didn’t exactly perfect it -you had to use your imagination to see an anchor in the wet, grey blob on your arm – but they sure paved the way. There were also stickers, decoders, action pictures, and umm… other rectangular pieces of cardboard. Granted, I haven’t been a regular consumer, and this is the first time that I have had any ‘jacks in at least 10 years. Boy, was I in for a rude awakening. After ripping open the wrapper on the “Prize”, I was left in stunned silence. I felt like I had slapped in the face by my previously faithful snack. Why? because my prize was a Big Dog brand sticker. For those not in the know, Big Dog is a brand of clothing. (Think low-rent Izod). They have their dog logo on sportswear, polo-styled shirts, boxers, etc. It gets worse. One the front, the sticker suggested that I should collect all ten designs. Yep, they made ten different stickers that incorporated the Big Dog logo. My vitriole and indignation drove me to the Cracker Jack website it appeared that they too were out of ideas. There was a contest running to “design a cracker jack prize.” They will gladly accept your idea, providing that you sign away all rights to it. Maybe in return they will give you a full set of all ten collectible stickers. All you have to do then is put those babies in your safety deposit box and wait. Oh, yeah. Re: Craker Jacks – Years ago – when they still made the “fun” prizes in CJ – my uncle bought a box and there was NO toy in the box. He wrote a great letter to CJ and told them of his huge disappointment at not receiving his toy, how he’d been a CJ consumer for years & years, etc. Guess what he got from CJ – 1 each of all the toys they made at the time and that was when they were made of more than cardboard or dog stickers.